MARINE FISHERIES: Journal of Marine Fisheries Technology and Management is a scientific journal in the field of marine fisheries technology and management. The journal publishes original research and review in scope of fishing gears, fishing technologies, fishing vessels and transportation, fishing port policy and management, and marine fisheries system. This journal has been accredited by Directorate General of Research, Technology and Higher Education Ministry of Research, Technology and Higher Education Republic of Indonesia since 2015. 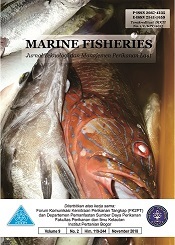 This journal is organized by Communication Forum and Partnership of Capture Fisheries in Indonesia and Department of Fisheries Resources Utilization Faculty of Fisheries and Marine Sciences Bogor Agricultural University. This Journal is published twice a year May and November.